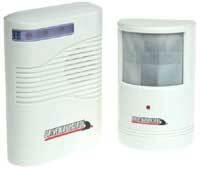 The Driveway Patrol™ wireless motion detector alerts you when someone approaches your home. 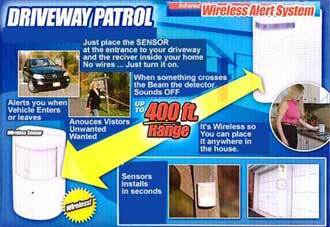 Simply place the transmitter along your driveway, up to 400 feet away from your house. Then place the receiver inside your home, no wiring is necessary. Whenever a vehicle or person passes by the sensor, the receiver will alert you with an audible tone. Extra receivers are available for multiple rooms. Weatherproof sensor/transmitter.